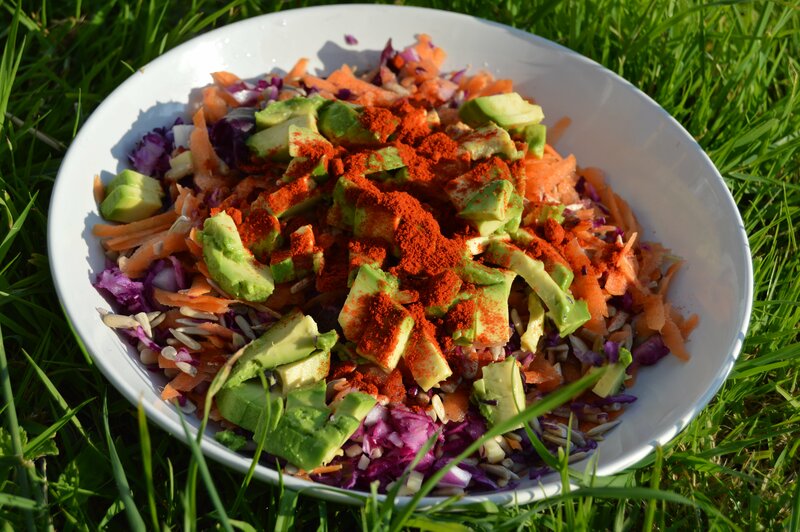 Quick and cheap raw salad that is a complete and filling meal. I often had this for lunch when I worked in an office. It will last 2-3 days in the fridge so I made half a weeks lunches at a time. It’s best to cut up the avocado just before eating. For the cider vinegar it’s best to use raw unpasteurised and unfiltered as it has the most goodness in but apple or white wine will give a similar flavour. I use red cabbage for this as the bright red colour is very appealing but it works just as well with white. The sunflower seeds are activated / soaked in water to make them easier to digest (removes enzyme inhibitors). They need to be soaked and drained for at least 10 minutes. If you have time its best to soak overnight and then drain and leave to stand for a few hours to for them to start opening up. Don’t worry if you can’t – I’m rarely that well prepared. Drain the soaked sunflower seeds. Mix together the seeds, carrot and cabbage. Sprinkle on the ginger, apple cider vinegar, onion and smoked paprika. Top with a diced avocado.